Brief study of II Kings 20 will demonstrate that this chapter falls during the reign of Sargon, the Assyrian who was king after Shalmaneser and before Sennacherib. Among the evidences of this order of events is that, when Hezekiah became ill, Isaiah told Hezekiah, “And I will add unto thy days fifteen years; and I will deliver thee and this city out of the hand of the king of Assyria; and I will defend this city for mine own sake, and for my servant David’s sake” (2 Kings 20:6). The deliverance of Jerusalem out of the hand of the Sennacherib under Hezekiah’s fearless leadership was yet future and occurred during those fifteen years added to his life. Those amazing fifteen years would never have transpired in Hezekiah’s life had he not prayed the intense and tearful prayer recorded in II Kings 20 and also in II Chronicles 32. The amazing deliverance of the city of Jerusalem under his leadership would not have occurred had he not made that heartfelt request. This is the first reference in Scripture to the word tears, a word found thirty-five other times in the Bible. However, when one adds the 170 references to forms of weep and 430 references to forms of cry, it becomes quite apparent that God’s mention of the anguished expression of voice and tears is not an isolated concept. Let’s see what God says about tears. Job wept (Job 30:25). Abraham wept (Gen 23:3). Jacob wept (Gen 37:35). Joseph wept (Gen 43:30). David and Jonathan wept (I Samuel 20:41). David and the people wept (I Samuel 30:4). Elisha wept (II Kings 8:11). The priests and the ministers of the LORD wept (Joel 2:17). Isaiah wept (Isaiah 22:4). Jeremiah wept (Jeremiah 13:17). Ezra wept (Ezra 3:12). Nehemiah wept (Nehemiah 1:4). Paul wept (Acts 20:19; II Corinthians 2:4). The disciples and elders of the church wept (Acts 20:37). Timothy wept (II Timothy 2:4). This list of men of Scripture who wept is by no means complete, but suffice it to say it is a list of men’s men, not of sissies! These were men who endured trials of faith, battles against foes, persecutions for their stands, disdain for their messages, and agonies due to the wickedness of those around him. Nor was Hezekiah a sissy. At his death, Hezekiah’s father Ahaz left behind an idolatrous culture and a ransacked temple, and Hezekiah turned Judah back to Jehovah. Ahaz left his son an apathetic, defeated populace, and Hezekiah rallied them to victory over Assyria. Ahaz left behind a generation of sin, and Hezekiah turned many to righteousness. Ahaz left to his son a court of criminals and a staff of seducers, and Hezekiah fired them all. After that, he enlisted the counsel and companionship of Isaiah and very likely Hosea (Hosea 1:1) and Micah (Micah 1:1) and filled his palace with godly and wise counselors who would help him reign righteously. His conviction, courage, and consistency led him to conquest. No sissy, he. Scripture’s shortest verse, John 11:35, informs the readers, “Jesus wept.” In Luke 19:41, Jesus “beheld the city, and wept over it.” Both Matthew and Mark tell of Jesus’ exceeding sorrow to the point of death in the Garden of Gethsemane (Matthew 26:28; Mark 14:34). Perhaps Hebrews 5:7 tells it most graphically: “Who in the days of his flesh, when he had offered up prayers and supplications with strong crying and tears unto him that was able to save him from death, and was heard in that he feared…” No wonder the prophet said, “He is…a man of sorrows, and acquainted with grief…Surely he hath borne our griefs, and carried our sorrows…” (Isaiah 53:3, 4). In his earthly sojourn in which he laid aside some of the free exercise of his impeccable deity, our Lord was “in all things…made like unto his brethren, that he might be a merciful and faithful high priest in things pertaining to God” (Hebrews 2:17). Our Saviour’s tears are but one item in a lengthy list of items in which he identified with his creation and his creature in his willingness to become the Saviour and succourer of mankind. When one considers that John declared that the works of Jesus Christ would take an entire world of books to record them all, it is no stretch to believe that many of those works involved Jesus’ tears for the bankrupt, the broken-hearted, the bound, the blind, and the bruised. Elkanah’s barren wife Hannah “was in bitterness of soul, and prayed unto the LORD, and wept sore” (I Samuel 1:10); God’s response was to give her Samuel. Note that this was a prayer accompanied by tears. Huldah the prophetess relayed to Josiah, “Because thine heart was tender, and thou didst humble thyself before God, when thou heardest his words…and didst rend thy clothes, and weep before me, I have even heard thee also, saith the LORD” (II Chronicles 34:27). For this agonizing in prayer, God granted Josiah the assurance that he would die before Nebuchadnezzar would raze the temple, ransack Jerusalem, and relocate the people. Observe again that this was a prayer with tears. Note that “when Ezra had prayed, and when he had confessed, weeping and casting himself down…(Ezra 10:1), God answered in unusual fashion and with amazing power. See once more that this was a prayer combined with tears. God promises to the faithful believers who seek souls that, “He that goeth forth and weepeth, bearing precious seed, shall doubtless come again with rejoicing, bringing his sheaves with him” (Psalm 126:6). Given that Paul wrote that his heart’s desire and prayer was for Israelites to be saved, it can be deduced with no twisting of Scripture that the weeping of Psalm 126:6 is not limited to the presentation of the Gospel to the sinner but includes weeping in prayer before the sinner is approached. God promises revival when prayer is combined with tears. James 4:9, 10 says, “Be afflicted, and mourn, and weep: let your laughter be turned to mourning, and your joy to heaviness. Humble yourselves in the sight of the Lord, and he shall lift you up.” This tear-prayer combo results in the glorious result of uplift for the one who weeps and mourns over sin. The brokenhearted tearful prayer is also the avenue to God’s comfort. “Blessed are they that mourn: for they shall be comforted,” said our Lord Jesus (Matthew 5:4). “Verily, verily, I say unto you, That he shall weep and lament, but the world shall rejoice: and ye shall be sorrowful, but your sorrow shall be turned into joy,” prophesied our Lord Jesus (John 16:20). Once again, the gracious and loving Saviour hears the prayer that is combined with the tears of the one praying. His holy heart is touched. He answers. Any person who understands the kind and tender nature of the God of heaven knows that tears gain that soul a specific access to his heart. No wonder, after outlining the foolish and sinful things that people do before finally humbling themselves before God and receiving his blessing, the Psalmist says, “Whoso is wise, and will observe these things, even they shall understand the loving kindness of the LORD” (Psalm 107:43). 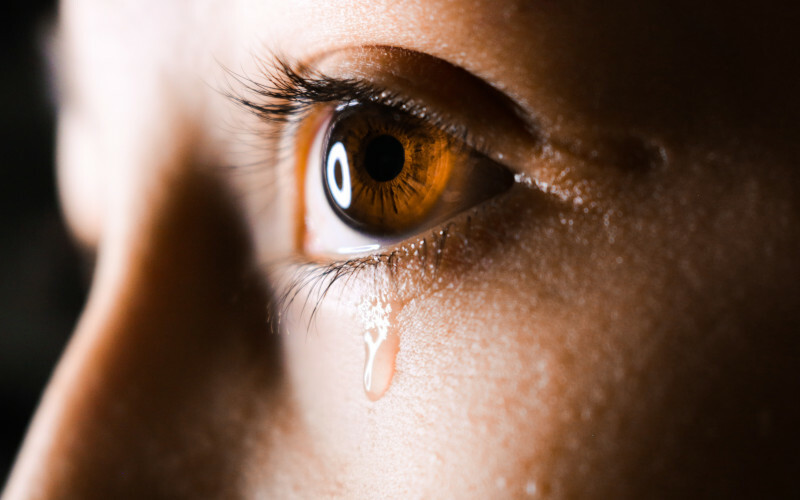 Paul wrote in Romans 12:15 that believers are to “weep with them that weep.” Looking with open eyes at one’s immediate environment will reveal a vale of tears. This is a world worn by wounding and weeping, a greenhouse grown over by groaning and grieving, a climate corrupted by crying and convulsing. In order that we may comfort those who are crying, grant grace to those who are grieving, or wipe the tears of those who are weeping, we must weep with them. It is as if God has thus chosen that the chemical reaction between the tears of two will somehow dilute the sorrow that one would bear on his own. May our great God comfort you, Dear Reader, to know that God sees your tears. Your tears do not define you as a weak ling or a coward. Your tears actually identify you as a companion of great men and women in Scripture and in history. Your tears actually identify you with Jesus Christ himself. Your tears actually identify you with a crowd of souls who gained precious and special access to God in their times of need. Your tears actually identify you as one who can and will help others bear the sorrows they will inevitably encounter. May our great God lead you, Dear Reader, to the valley of Baca (Psalm 84:6) where you will make a well and drink from the pools filled with tears. While that valley is not geographical, it is spiritual. We do not like traveling through it, but we grow there and come out the better for the benefit of many. Editor’s Note: This article was originally published in the bi-monthly sermon paper the Trumpet of Truth. Used by permission. Dr. Jeff Farnham is a revivalist and conference speaker residing in LaGrange, Indiana. He has been preaching for over four decades and is currently available for revivals, family conferences, marriage retreats, youth camps, and other special meetings. During his tenure in a twenty-year pastorate in northern Indiana, he authored five books, published a bi-monthly paper The Trumpet of Truth, and spoke in special meetings in several US states and Canadian provinces. He is married to his lovely wife Kathryn (40 years), and together they have five grown children and seven grandchildren. To book Dr. Farnham for a meeting or conference at your church, call 260.350.3039. How Do I Become a Godly Man?